Welcome to Grapevine Physical Therapy & Sports Medicine's patient resource about Interposition Arthroplasty. Elbow arthritis may be surgically treated with a procedure called interposition arthroplasty. The term interposition means that new tissue is placed between the damaged surfaces of the elbow joint. 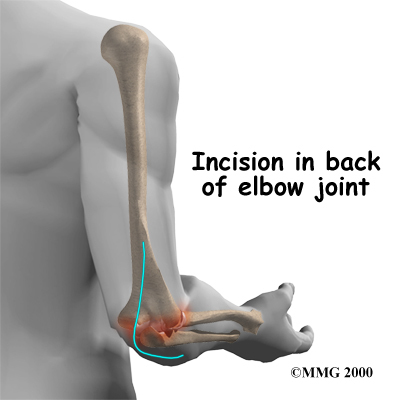 In this surgery, tissue is taken from another source to fill in the space in the elbow joint. The soft tissue forms a false joint. This surgery has best results in younger people with healthy tissue around the elbow joint. Which parts of the elbow joint are involved? 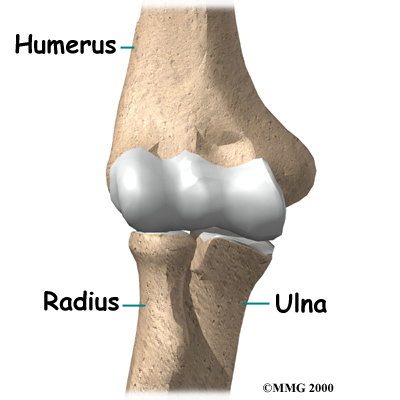 The ulna and the humerus meet at the elbow and form a hinge. This hinge allows the arm to straighten and bend. The large triceps muscle in the back of the arm attaches to the point of the ulna (the olecranon). When this muscle contracts, it straightens out the elbow. The biceps muscle in the front of the arm contracts to bend the elbow. Inside the elbow joint, the bones are covered with articular cartilage. 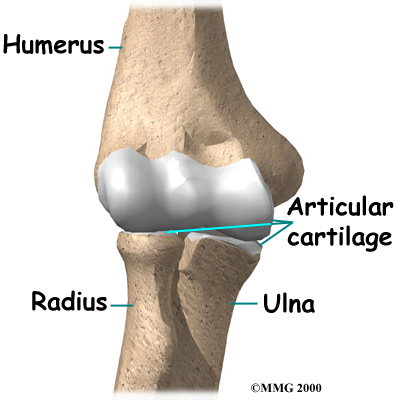 Articular cartilage is a slick, smooth material. It protects the bone ends from friction when they rub together as the elbow moves. Articular cartilage is soft enough to act as a shock absorber. It is tough enough to last a lifetime, if it is not injured. The main goal of interposition surgery is to ease the pain of osteoarthritis where the surfaces of the elbow joint are rubbing together. A piece of tendon or other soft tissue forms a spacer that separates the surfaces of the joint. 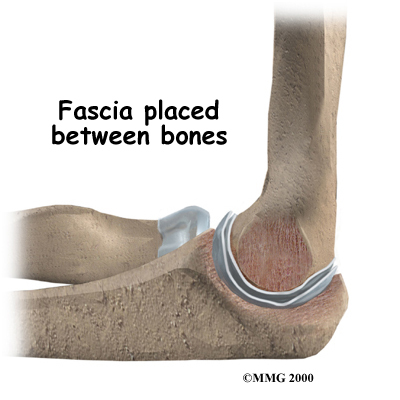 Interposition arthroplasty is different than a fusion surgery. Fusion simply binds the joint together, and the elbow loses much movement. 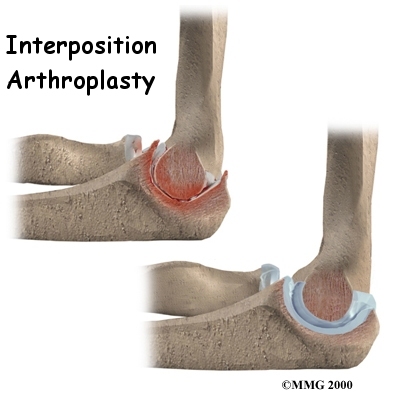 Interposition arthroplasty can help take away pain while allowing the elbow joint to retain some movement. Surgery can last up to 90 minutes. Surgery may be done using general anesthesia, which puts you completely to sleep, or local anesthesia, which numbs only the arm. With a local anesthetic you may be awake during the surgery, but your surgeon will make sure that you won't be able to see the surgery. Once you have gotten anesthesia, your surgeon will make sure that the skin of your elbow is free of infection by cleaning it with a germ-killing solution. The surgeon will make an incision along the back of your elbow. The incision is made on the back side because most of the blood vessels and nerves are on the inside of the elbow. Entering from the back side helps prevent damage to them. The tendons and ligaments are then moved out of the way. Special care is taken to move the ulnar nerve, which runs along the elbow to the hand. Once the ends of the joint are exposed, scar tissue and bone spurs (small points of bone) are removed. Then the surgeon shapes the ends of the elbow joint. This is done to make space for new tissue between the joint surfaces. The surgeon then removes a rectangular-shaped piece of fascia tissue from the side of your thigh. (Fascia is a flat connective tissue that wraps around your muscles and organs.) This sheet of tissue is folded three times and sewn onto the end of the humerus bone. The new tissue forms a pad to separate the joint surfaces of the elbow. Once the new piece of tissue is in place, the soft tissues over the joint are sewn back together. Metal pins are then placed through the humerus and ulna bones. The pins stick out through the skin. A hinged elbow brace is attached to the pins to hold the surfaces of the elbow joint slightly apart. This device is worn for four to six weeks after surgery. Any operation carries a small risk of infection. Interposition arthroplasty of the elbow is no different. You will probably be given antibiotics before the operation to reduce the risk of infection. If an infection occurs, you will most likely need more antibiotics to cure it. You may need additional operations to drain the infection if it involves the area around the arthroplasty. All of the nerves and blood vessels that go to the elbow travel across or near the elbow joint. Because the operation is performed so close to the nerves and vessels, it is possible to injure them during surgery. If the injury was caused by retractors stretching the nerves out of the way, the symptoms are usually temporary. Permanent injury to the nerves or blood vessels is rare, but it can happen. What do I need to know after surgery? After surgery, your elbow will be bandaged and supported by a movable splint. 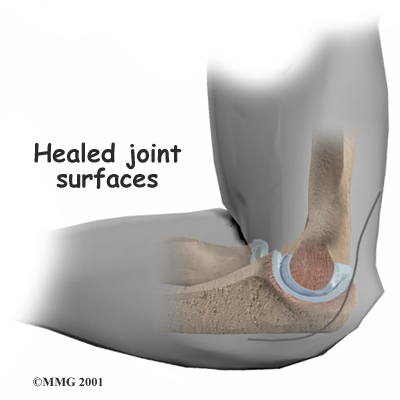 The splint holds the surfaces of the joint apart slightly as they heal. Your surgeon will want to check your elbow within five to seven days. Stitches will be removed after 10 to 14 days, though most of them will have been absorbed into your body. You may have some discomfort after surgery. Your surgeon can give you pain medicine to control the discomfort. You should keep your elbow elevated above the level of your heart for several days to avoid swelling and throbbing. Keep your elbow propped up on a stack of pillows when sleeping or sitting. After surgery, you'll wear the elbow brace for up to six weeks to give your elbow time to heal. Then you may be ready to see a Physical Therapist at Grapevine Physical Therapy & Sports Medicine to direct your recovery program. Although the time required for rehabilitation varies among patients, as a guideline you may need to attend Physical Therapy sessions for one to two months, and you should expect full recovery to take up to four months. Our first few Physical Therapy treatments will focus on controlling the pain and swelling from surgery. Our Physical Therapist may use heat treatments, gentle massage and other hands-on procedures to ease muscle spasm and pain. When you are ready, we will instruct you to begin gentle range-of-motion exercises, which may include active elbow movements and passive stretching. You Physical Therapist will then introduce strengthening exercises to give extra stability to your elbow joint. As with any surgery, you need to avoid doing too much, too quickly. Some of the exercises we'll have you do are designed to get your arm working in ways that are similar to your work tasks and daily activities. Our Physical Therapist will help you find ways to do your tasks that don't put too much stress on your elbow joint. Before your therapy sessions end, our therapist will teach you a number of ways to avoid future problems. At Grapevine Physical Therapy & Sports Medicine, our goal is to help you keep control your pain, improve your strength, and maximize your range of motion. When your recovery is well under way, regular visits to our office will end. Although we will continue to be a resource, you will be in charge of your own exercises as part of an ongoing home program.